I’m trying to use up some of my thread stash. I used to be obsessive about matching thread colour to fabric, so every new project required taking a little fabric swatch into John Lewis and carefully selecting the most appropriate shade of Coats and Clark thread. I’ve just checked the Coats and Clark website and am faintly surprised to discover there are only 69 shades available. It seems like a lot more when you’re faced with them in the shop. Obviously this behaviour resulted in my accumulating a large shoebox full of spools of thread. Then I tried sewing a large-scale black and white print. What thread to use? Clearly no match was possible, so a decision had to be made. I plumped for white. I now realise that black would probably have been better – always go darker rather than lighter if you can’t match – but the white worked fine. So now I’m working my way through the shoebox using whatever’s about the right colour for each project. I haven’t bought sewing machine thread other than black, white, or red for ages. For the current project I need grey and found that the only grey thread I had left was 100% cotton. For some reason I used to think you should only sew cotton fabric with cotton thread and bought a lot of the stuff. But then I switched to polyester thread when I realised how much stronger it is. Now I’m paranoid about using up the cotton – it’s so weak! What if all my seams break? None of the dresses I sewed with the cotton thread actually came to pieces, but I still worry. The overlocker’s threaded in black (polyester) not grey, but hey. I’m going to overlock all those seams. Anyone know where the ‘only sew cotton with cotton’ thing comes from? Or had a disaster sewing with polyester? Posted on December 21, 2011 December 20, 2011 by catherinedaze	This entry was posted in thread and tagged sewing, thread. Bookmark the permalink. You should not sew with thread that is stronger than your fabric. If your seam comes under stress, it is better for the thread to rip (since you can re-sew the seam), rather than for the fabric to rip. That’s the logic anyway. In real life, I doubt if it matters much. That makes sense, although as you say, it’s not been a problem in practice yet. Fingers crossed! That’s interesting, I’d never thought of wanting to dye a garment after sewing. Thanks! I think it’s also to do with shrinkage – if you’re not a pre-washer, having thread that shrinks similarly to your fabric in the first garment wash isn’t bad. But if you are a pre-washer, doom! Rippled seams! I’m very much a pre-washer so i guess sticking to polyester is the way to go. Thanks! I asked in a fabric / thread shop whether their cotton thread was pre-shrunk, as I was going to pre-wash my fabric and they assured me it was. Good thing or all my seams on cotton clothes would shrink! I tend to sew with polyester always because I’m afraid of the shrinkage when washing the finished item. Mind you, this has never happened to me personally… I’m only going on advice and/or hearsay. 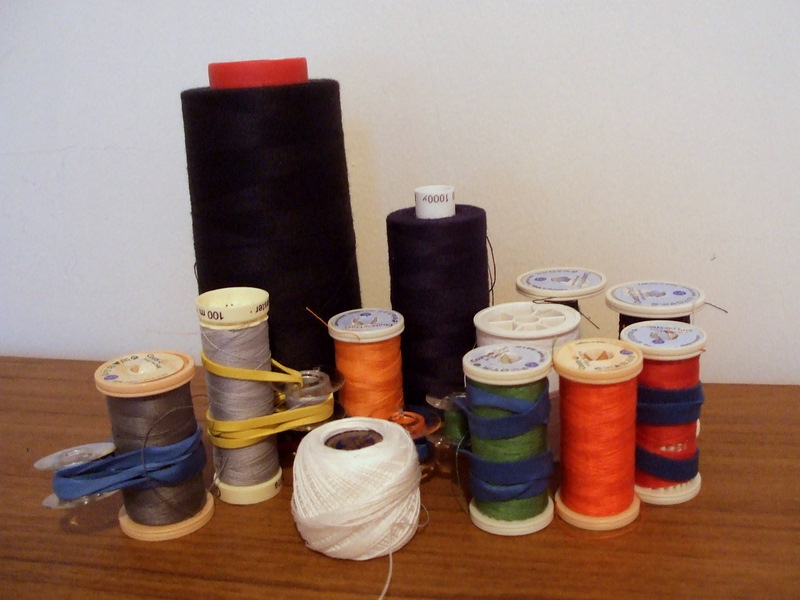 I have used silk when I sew silk or wool fabrics, but I’ve never used 100% cotton thread. My quilting friends won’t use anything but cotton, though. I’d love to get some silk thread for hand-sewing. I hear it’s much less aggravating than any other kind. I wonder why quilters prefer cotton? I use poly for most things and silk for some hand sewing. What about using the cotton thread for basting? That’s what I do with thread remnants in colors that I’m not likely to use again. I use the really bright colours for tailor tacking, but the many shades of brown would certainly be good for basting, thanks! Easy to remove, too. The only thing I’ve ever heard (from a rather rude and stuck up sounding sewing machine salesman) is that polyester thread will gunk up your machine faster. I’ve never had a problem with it but my mom’s machine is newer and she will only sew with Mettler thread, which is really nice stuff but I’m not sure of the content. I’ve not seen Mettler thread round here. The other one you can get besides Coats and Clark is Gutermann which I think is a bit more ‘premium’ but my machine seems OK with either, apart from its mysterious tension issues which seem to be independent of thread. I always thought of cotton as more ‘hairy’ than poly though and more likely to shed. Wonder if I can get them under a microscope! Cotton also loses strength when it’s old. I have some mystery spools and always check it before starting by giving it a good tug. If it breaks don’t use it. I think I’m definitely going to use most of it for muslins. My mum just gave me some old linen thread (pre-decimalization so at least 40 years old) and that’s kept its strength, which surprised me. Great, I’m so glad you like it! Since I picked it up to review I’ve been reminded of how much I enjoy it myself. Happy Christmas!